If you were one of the people that went to a theater and watched Spielberg's Lincoln, you know that the movie was about as good as it gets. I loved that it made enough of an impact to clean up an unresolved legal oversight. You go Mississippi...you may get it right yet! 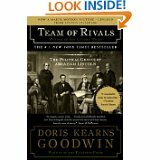 Go see the movie and maybe even read the book that the movie was based on...it is called Team of Rivals: The Political Genius of Abraham Lincoln and is written by Doris Kearns Goodwin. I, for one, am going to read it very soon. My first thought on hearing this was "You can't make this stuff up." I would also recommend an absolutely excellent non-fiction book written by an educated, former slave titled "Incidents in the Life of a Slave Girl" by Harriet Jacobs. Harriet is amazingly articulate, and this book, released first in Europe in 1851, didn't make it's way to mainstream America until 1973. Harriet's story, beautiful and articulately written, makes it crystal clear that slavery corrupted every single individual involved, up to and including the North, particularly after passage of the Fugitive Slave law. Nicely enough, it's in the public domain, and therefore available as a free e-reader download if you are interested. Yes I am interested. Thank you for the tip.